Cockroaches are winged insects found in nearly every part of the world. Although they are one of the most primitive living insects, they are very adaptable and highly successful. Some of the species have invaded human habitats and are considered pests since they can spread disease. Cockroaches or roaches belong to the order Blattaria, which means "to shun the light." They were given this scientific name because they sleep and rest during daylight hours and come out mainly at night. Their common name, however, is a version of the Spanish word cucaracha , which means "crazy bug." If you have ever seen one running away from you in a typical wild and zigzagging way, you know how they got their name. There are some 4,000 species or kinds of cockroaches living in nearly every habitat except Antarctica. All of them prefer to live where it is warm and moist, or where they can at least get water, so it is not surprising that they will move into people's homes if given the chance. Actually, only about 35 of these species are ever associated with people, and the other nearly 4,000 species live throughout the world, although the largest numbers are found in the tropics. Cockroaches can be interesting, and some would even say fascinating. They can range in length from only 0.1 to 3.2 inches (2.5 to 8.1 centimeters). They seldom use their wings to fly, although some can fly around. Their bodies have a waxy covering that keeps them from drowning. They also can swim and stay underwater for as long as ten minutes. They will rest in one spot without moving for eighteen hours a day, and can go a long time without food. They eat only at night. As for what they eat, they are omnivorous (pronounced om-NIH-vaw-rus), meaning that they can and will eat anything, plant or animal. The more we learn about their diet, the more disgusting they seem, since they eat everything, including animal feces. Although they will eat wood, which is made up of cellulose, they are unable to digest it on their own and, thus, depend on certain protozoa (pronounced pro-toe-ZO-uh) or single-celled organisms that live in their digestive tracts or gut, to break the cellulose down. They make sure they always have these protozoa in their systems by eating the feces of other cockroaches. Oviparous: Producing eggs that hatch outside the body. Cockroaches are escape artists whose zigzag darting is done at what seems lightning speed. They can climb easily up vertical surfaces and have such flat bodies that they can hide in the tiniest of cracks and crevices. They have compound eyes (honeycomb-like light sensors) and antennae that are longer than their bodies, which they use to taste, smell, and feel. They even have a special organ in their mouths that allows them to taste something without actually eating it. Each of their six strong legs has three sets of "knees," all of which can sense vibrations and therefore serve as an early warning system. They also have little motion detectors on their rear end, which explains why they are so hard to catch and stomp. Although females mate only once in their lifetimes, they will stay fertilized all their lives and keep producing eggs without the help of a male cockroach. Like most other insects, cockroaches have an exoskeleton, meaning their skeleton is located on the outside of their bodies. They have three simple body parts: the head, thorax, and abdomen. Their head is dominated by their long antennae that are constantly moving and sensing the environment. These long, whiplike feelers are used to taste, smell, and feel things, as well as to locate water. To a cockroach, its antennae are more important than its compound eyes on top of its head. Their mouths have jaws that move from side to side instead of up and down, and their versatile mouths allow them to bite, chew, lick, or even lap up their food. They also have unique parts in their mouth called "palpi" that come in handy when humans try to poison them since it allows them to taste something without having actually to eat it. Its thorax is the middle section of the body; the insect's six legs and two wings are attached to it. Two claws on each foot, plus hairs on their legs, enable them to hold on tightly or climb a wall easily. Their legs are strong and can propel them up to 3 miles (4.8 kilometers) per hour. The abdomen is the largest part of their body, and has several overlapping sections or plates that look like body armor. Their brain is not a single organ in their head, but is rather more like a single nerve that runs the length of their bodies. Their heart is simple, too, looking more like a tube with valves, and their blood is clear. They do not have lungs, but instead breathe through ten pair of holes located on top of the thorax. the mother's body. She can produce up to fifty babies at once, sometimes within only three weeks. The hatched eggs produce nymphs (pronounced NIMFS), which look like miniature adults. As the new roach grows, it sheds or cracks its outer skin and drops it or molts, growing a new, larger covering. Its does this as much as twelve times before it reaches adulthood. Cockroaches can live anywhere from two to four years. Aside from most people's natural dislike of any sort of "bug" crawling around where they live, the fact that cockroaches can carry diseasecausing microorganisms gives us a very good reason not to want to have them in our homes. Outside or in their natural habitat, they have many natural enemies, including birds, reptiles, mammals, and even other insects. But in our homes none of these usually exist, so cockroaches can reproduce continuously unless removed. Poisons must be used carefully in the home, and it is important first to deny cockroaches access to the indoors by filling cracks to the outdoors. Their food supply can be restricted if we do not leave out any food overnight and keep the kitchen counters and floors swept of crumbs. Leaky faucets and half-full glasses will also provide them with the water they need, so it is important to deny this. There are four common types of cockroaches that many of us know, sometimes too well. 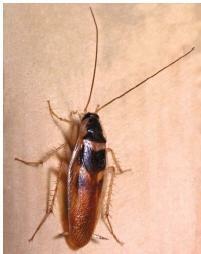 The dark American cockroach is large and is sometimes called a "water bug" or "palmetto bug." The German cockroach is the smallest and has two black streaks down its back. The Australian cockroach is a smaller version of its American cousin, and the Oriental cockroach is reddish-brown or black and is often called a "black beetle." Despite most people's natural dislike of cockroaches, some keep them as pets in an escape-proof terrarium. This recalls an old Italian expression that is translated as "Every cockroach mother thinks her baby is beautiful." I forgot to ask in my last question, do cockroaches bite? Do cockroaches get on dogs, and if so can the dog carry the roaches to and from domiciles? 1.What is the outer skeleton of cockroach called? How much can baby roaches can a mother German roach give birth to in one day? How long does it take for a mother roach to give birth to baby roaches? What kills German roaches? Is a German roach's bite harmful?